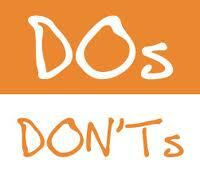 Home > Blog > Blog > Do’s and don’ts of running a Facebook contest or promotion. Running a competition or promotion through Facebook is an excellent way to increase your fan base and keep existing fans coming back to your page. It must be said however that there are strict guidelines to follow and if ignored you can put your page at risk of being removed or suspended by Facebook. As a quick overview, promotions on Facebook must be administered within Apps on Facebook.com or you can go through a company such as Binkd to assist you in setting up the Apps for this purpose or there are many Apps that you can download at a fee. The only way people can enter a contest on Facebook is by entering their information on a page within the app. It is also important to state that the promotion is in no way sponsored or endorsed by Facebook. More importantly you cannot use Facebook features or functionality, such as the “Like Button” as a voting tool for a promotion. For example you can’t ask fans to “like” this to win or “share” this post to win. However you can ask fans to like your page before they enter the contest in this way increasing your fan base. Just by going onto Facebook, you will see that many companies are not following these rules but it could be a risky exercise. I have seen some big brands running competitions illegally on Facebook and they could potentially be shut down and lose all of their fans that they have spent months, if not years collecting.